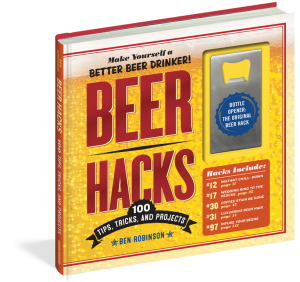 After reading Beer Hacks I can tell you it comes with a “church key” in a plastic pocket that is part of the hard cover. I can also report that I now know how to turn beer bottles into glasses, guitar slides, shot glasses and votive candle holders. Why? I still don’t know. The parts on How to Order and Cary Beers at sporting events, party drinking, Beer Pong and Shotgun tips, Beer Festival Survival hints and how to tap a keg of beer safely are probably included in the by-laws of Greek Societies on the college and university campuses here in the United States of America. However, I can report that there is a hidden gem in this collection of sound bites. In the brief Beer Cocktails section #42 he offers a recipe for “Beer Simple Syrup”… this is brilliant! Particularly using different beers. Learn how beer is actually made! In closing I can say that Beer Hacks is a great gift for any young person starting their collage careers, especially for those going away from home for the first time. Your parents should consider this your survival guide.